What is so important about iron? Every living cell—whether plant or animal—contains iron. If you look at the information presented in most exercise physiology and sports nutrition books, you will notice an obvious omission of discussions of muscle cramps. The meal plan for an athlete trying to lose weight is similar to the meal plan for any athlete, but it contains slightly fewer calories than are necessary to maintain weight. Gain the vegetarian advantage! Vegetarian meal plans have been used successfully in everything from bodybuilding to endurance sports. Every day more and more athletes—even those who are not full-time vegetarians—incorporate a plant-based diet when training or recovering from competition. Relying on the recent evidence-based research, Vegetarian Sports Nutrition details performance and health benefits, including enhanced muscle recovery and optimal bone health. With tailored meal plans and training strategies, you will learn to make smart nutritional decisions and to properly fuel your body throughout your training regimen. This comprehensive resource simplifies the process of determining your energy, protein, vitamin, and mineral needs and monitoring carbohydrate and fat intake. 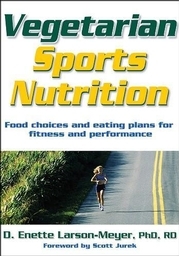 You’ll learn how to optimize a vegetarian diet for peak performance across all sports. Whether you are a dedicated vegetarian looking to add variety to your diet or an athlete searching for a competitive edge, Vegetarian Sports Nutrition will help you improve your health and performance! D. Enette Larson-Meyer, PhD, RD, FACSM, is an assistant professor of Human Nutrition at the University of Wyoming, where she also serves as director of the nutrition and exercise laboratory. She is a registered dietitian with training in exercise physiology and has experience working with vegetarian (and nonvegetarian) athletes. Her research focuses on how nutrition and metabolism influence the health and performance of active people. Dr. Larson-Meyer served as the sports nutritionist for the University of Alabama at Birmingham Athletic Department from 1995 to 2000, and she has consulted with numerous athletes throughout her career. She is a fellow of the American College of Sports Medicine and is past chair of the Vegetarian Nutrition Dietetic Practice Group. Dr. Larson-Meyer has published numerous scientific and consumer articles, has been featured in publications like Vegetarian Journal, and has served as a chapter contributor to publications including the American Dietetic Association's Sports Nutrition: A Guide for the Professional Working with Active People and the International Olympic Committee Medical Commission's Volleyball (Handbook of Sports Medicine and Science). She completed her dietetic internship at Massachusetts General Hospital in 1988 and also completed an internship at the Olympic Training Center in Colorado Springs during her undergraduate training. Larson-Meyer received her PhD in Nutrition Sciences from the University of Alabama in 1998. A serious recreational athlete for close to 20 years, Larson-Meyer enjoys running distance events, cycling, and dancing in her spare time. She lives in Laramie, Wyoming, with her husband and three children.